Tim Kuhfuss, UW's director of research support for information technology, stands in the spot in the IT Data Center where the campus cluster will be placed. The cluster will enable atmospheric and earth sciences faculty -- who will be able to use the NCAR-Wyoming Supercomputing Center -- to learn what to expect with the software. It also will provide a research resource for UW research faculty -- such as bioinformaticists, social scientists, pure mathematicians and theoretical physicists -- whose research doesn't fall within the scope of the NWSC. Yellowstone, meet your super cousin. While a number of University of Wyoming faculty will conduct computational sciences research at the world-class NCAR-Wyoming Supercomputing Center (NWSC) in Cheyenne next fall, many more professors will be able to do the same -- on a smaller, but still world-class scale -- on campus. While the $30 million supercomputer in Cheyenne is known as Yellowstone, its smaller counterpart will have an official moniker -- relative to a state landmark -- in the next few months. Plans are in the works to create a "campus cluster" or on-campus supercomputing site known as the Advanced Research Computing Center (ARCC). The high-performance center will use approximately 500 square feet in the university's Information Technology building and include roughly 5-10 percent of the 75,000 central processing units (CPUs) available at the NCAR site. The CPU is essentially the computer's brains, where most calculations take place. "We already have access to the facility in Cheyenne. We're also going to build a smaller version on campus," says Tim Kuhfuss, UW's director of research support for information technology. "We'll serve as a proving ground for the supercomputing center. Faculty will see if a job runs well here. 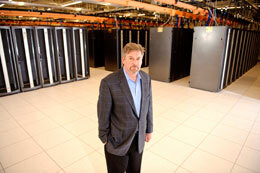 If so, then they can scale up to use of the supercomputing center." Requests for proposals (RFPs) for the cluster project went out the week of Jan. 23, and six companies submitted proposals. Kuhfuss expects a company to be selected by late spring, with the campus cluster operational by fall 2012. The campus cluster will serve two purposes, according to Bryan Shader, a UW professor of mathematics and special assistant to the vice president of research and economic development. One, it will enable atmospheric and earth sciences faculty -- who will be able to use the NWSC -- to learn what to expect with the software. The cluster provides the opportunity for those particular faculty to work out issues caused by scaling up parallel algorithms from tens or hundreds of processors to thousands of processors, before moving up to tens of thousands of processors on the NWSC supercomputer, he says. Two, the cluster will provide a research resource for UW research faculty -- such as bioinformaticists, social scientists, pure mathematicians and theoretical physicists -- whose research doesn't fall within the scope of the NWSC. Alex Buerkle, a UW associate professor of botany, and some of his students will use ARCC to determine the pattern of chromosomes, or DNA sequencing, in such species as the lodgepole pine, spruce tree and the Melissa blue butterfly. In a given month, Buerkle says he and his students already use tens of thousands of hours of computer time for their research. "We will use the (ARCC) computers to put together genome (entirety of an organism's hereditary information) for animals and plants for which the genome isn't known," Buerkle says. "Computers are really important for processing DNA sequences. We have a lot to do. We need tens of thousands of hours of computing time." Buerkle likened the cluster supercomputer to "having more workers to do the job." "This will be the equivalent of having thousands of desktop computers working at once," he says. "It will allow you to do your work faster." Fred Ogden, a UW professor in the Department of Civil & Architectural Engineering and Haub School of Environment and Natural Resources, also will use the campus cluster. Ogden spearheads UW's efforts with the CI-WATER project that focuses on the hydrology of the Colorado River Basin. The CI-WATER project will help assess long-term impacts of water resources management decisions, natural and man-made land-use changes, and climate variability -- with an emphasis on the Rocky Mountain West, Ogden says. "The CI-WATER project includes significant funding ($1 million) that will be used to purchase computing hardware for the UW campus," Ogden says. 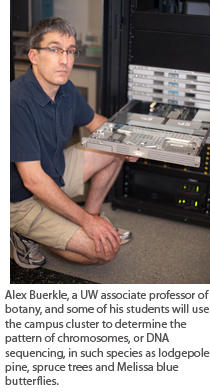 "The UW computing cluster will provide a place for our project to develop and test our code. Once things are running correctly, we will run larger simulations on the NCAR-Wyoming supercomputer." The CI-WATER project is a joint collaboration among UW, the University of Utah, Utah State University and Brigham Young University. Cooperators include the U.S. Army Corps of Engineers and NCAR. EPSCoR (Experimental Program to Stimulate Competitive Research) provides research funding to states, including Wyoming, that typically receive lesser amounts of NSF research and development funding. The campus cluster will be convenient and cost-effective, subscribing to a "condominium model," as Shader describes it. "The university will provide the base infrastructure for the campus cluster -- personnel to run it, the networking and the basic computing architecture to keep it running," Shader says. "The idea is that researchers will invest in this, just like a condominium." "Faculty will receive the convenience of having someone else take care of it and the convenience of using a larger portion (of the cluster) when it's available," Shader says. "But faculty would have to agree, when they're not using the nodes they purchased, that other faculty can use those nodes." Kuhfuss expects the campus cluster to be in place sometime this summer. "By the time you put our campus cluster together with what we have in Cheyenne, we're way up there (nationally) in computing capacity," Kuhfuss says. "Maybe one of the largest nationally." "If the facility in Cheyenne is the penthouse, this computer in IT will be the elevator," Buerkle says. "It will get us there." The NWSC will contain some of the world's most powerful supercomputers (one petaflop, which is equal to one quadrillion computer operations per second) dedicated to improving scientific understanding of climate change, severe weather, air quality and other vital atmospheric science and geo-science topics. The center also will house a premier data storage and archival facility that holds irreplaceable historical climate records and other information.